Prime Minister Justin Trudeau and his wife Sophie Trudeau lay a wreath at the National War Memorial in Ottawa on behalf of the government and people of Canada. Thủ tướng Justin Trudeau cùng Phu-nhân, thay mặt cho Chính-quyền & toàn dân Gia-nã-đại, đặt vòng hoa tại Đài Tưởng Niệm các Chiến-sĩ tử trận, Ottawa. About 35,000 people young and old gathered at the National War Memorial in Ottawa today to honour and remember the Canadians who lost their lives fighting on behalf of their country in wars and military missions. They heard prayers, a 21-gun salute and the skirl of bagpipes as marching bands passed dignitaries led by Gov. Gen. David Johnston. 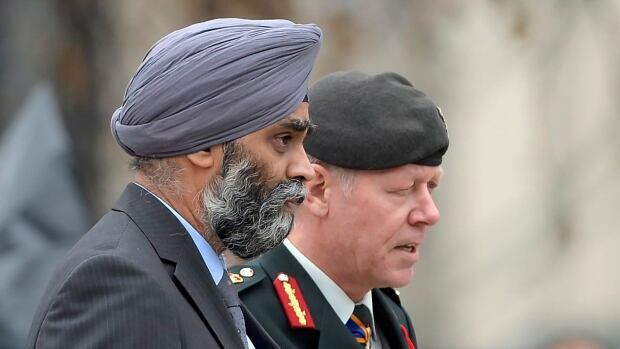 Johnston was flanked at the memorial by Prime Minister Justin Trudeau and his wife, Sophie Grégoire-Trudeau, Defence Minister Harjit Sajjan, this year's Silver Cross Mother, Veterans Affairs Minister Kent Hehr and other dignitaries. At 11 a.m., all observed two minutes of silence, followed by a flypast of two Canadian Forces CF-18 jets. The chaplain general of the Canadian Forces, Guy Chapdelaine, invited Canadians to pray for God's blessing and guidance, "or simply to use this moment for personal reflection as others pray." Chapdelaine, a Roman Catholic priest, then said prayers in English and French. 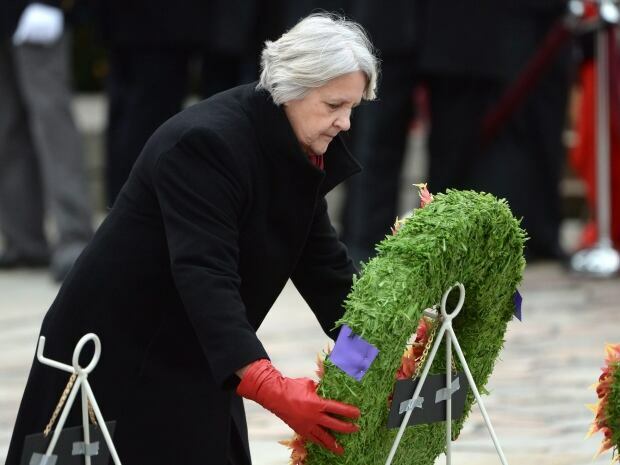 Sheila Anderson, of Yellowknife, the 2015 National Memorial (Silver) Cross Mother, placed a wreath at the National War Memorial on behalf of all Canadian mothers who lost children in the country's wars. She lost her son, Cpl. Jordan Anderson, in Afghanistan in 2007. He was among six Canadian soldiers killed by a roadside bomb. "It's a great honour to represent the families of the fallen," she told CBC News Wednesday. "I'm going to be thinking about all the families, the mothers, the fathers, the brothers and sisters, and the spouses of the fallen soldiers." Wreaths were also placed by the Governor General, the prime minister and, later, representatives of dozens of veterans groups and legions. Honorary Chaplain Rabbi Reuven Bulka, of Ottawa, reminded those present of the killing of Cpl. Nathan Cirillo, which took place at the memorial on Oct. 22, 2014. "What happened last year is an eternal reminder that those who stand on guard for us do so not only overseas but also right here in our greatly beloved country," he said. "Remembrance is a door-opener to a higher emotion, the feeling and expression of gratitude." Earlier, Trudeau issued a statement calling on Canadians "to join me in expressing our heartfelt gratitude to all those who have worked and fought so courageously to keep us safe." "To the brave members of the Canadian Armed Forces currently serving at home and abroad, we proudly salute your unwavering commitment to protecting Canadians, and to bringing peace and security to the world." After the official ceremony, as the carillon bells rang from Parliament Hill's Peace Tower, the gates surrounding the National War Memorial were opened and thousands stepped up to place their poppies on the Tomb of the Unknown Soldier in what has become a tradition.